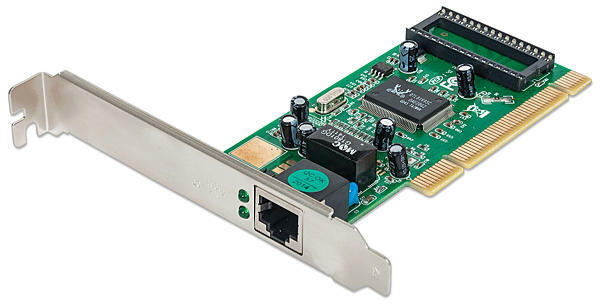 A network card (also known as a Network Interface Card, NIC, Network Adapter, or Ethernet card) is used to connect a computer to a high-speed network. If your homebuilt computer will be on a local network or if you connect to the Internet using DSL, cable, fiber, or satellite Internet service, then will need to install a NIC if one isn't built into the mobo. Most motherboards nowadays come with NIC's built into them, and most of the time they work well. If you need an additional NIC, if the onboard NIC fails, if it isn't supported by your operating system, or if it's just not working right, most people should install a 1000 Mbps Gigabit Ethernet adapter. If you're lucky enough to live someplace that has Gigabit Internet, then you should install a 10 Gigabit Ethernet card. Either way, don't waste your money on a 10/100 NIC. They're obsolete. High-quality networks cards are inexpensive enough that it really doesn't pay to skimp. The five or ten bucks you may save by using an el-cheapo, no-name NIC isn't worth having to drive to the computer store, buy a new one, re-open your computer case, and install a new NIC when the cheap NIC fails or doesn't perform to your expectations. Almost any NIC will come with drivers for all recent Windows versions. If you are planning to install a different operating system like Linux or BSD, then make sure your NIC will work with the OS you plan to use. I usually use Intel-based NIC's on Linux or other UNIX-like systems. If you connect to your router wirelessly, then you'll need a wireless adapter. I like PCI-e wireless adapters because I find them much faster than USB adapters. You also may want to consider one with wires that lead from the card to the antennas. Usually the back of a computer that's on the floor is not the best place for an antenna to get good signal. The word "modem" is short for "modulator/demodulator." A modem converts your computer's digital data to analog data that can be sent over a POTS (Plain-Old Telephone Service) line, and converts incoming analog data to digital data that the computer can understand. If you connect to the Internet using dial-up service, then you will need either an internal modem or an external modem. Not many people use dial-up modems anymore, so only a handful of motherboards come with them built-in. Internal modems can be purchased inexpensively; but just as with network cards, you get what you pay for. Most cheap modems are not really modems at all. Rather, they use software and your computer's system resources to modulate and demodulate data. Better-quality modems have built in controllers that do the work right on the card. They produce a faster, more stable, and more reliable connection than do cheap software modems. External modems that connect to a computer's USB port are also available. As with NIC's and most other computer parts, if you are planning to install an operating system other than Windows, then make sure your modem will work with the OS you plan to use before you plunk down any money.